One thing that you will not hear public sector pretrial advocates discuss is what the public thinks of bail reform. Because no matter how much they believe that there is a need to abolish commercial bail and reform the so called “injustice” of requiring criminal defendants to financially secure their release, one thing remains true…the public doesn’t agree. In a recent survey conducted among Texas residents, we asked 7 different questions about the criminal justice system and the bail reform movement. The responses we received were not only surprising to even us, but diametrically opposed to the narrative being perpetuated by those advocating for more FREE releases from jail. When the public was simply asked, should a defendant be released from jail for free or should they be required to financially secure their release with a bail bond, they overwhelmingly responded in favor of defendant paying for their own release with a bail bond. In fact 88% of respondents supported this concept with only 12% favoring free release. It appears that the support that is supposedly behind the bail reform movement and public sector pretrial release is not coming from the actual public. Instead, it appears that this entire movement is being driven by advocates acting on their own behalf with little to no public support of their issue. It is time for our decision makers to finally listen to the public. It is time for our elected officials to truly speak for the very people that they were elected to represent. It is time to ask the public what they think. So we did. When asked if bail agents played an important role in the criminal justice system, respondents once again overwhelmingly agreed with 84% answering in the affirmative. 70% of respondents disagreed with ongoing bail reform efforts taking place across the country and the concept of releasing defendants for FREE. 69% of respondents would not vote for any public official or judge that supports releasing defendants for FREE over the use of a financially secured bail bond. 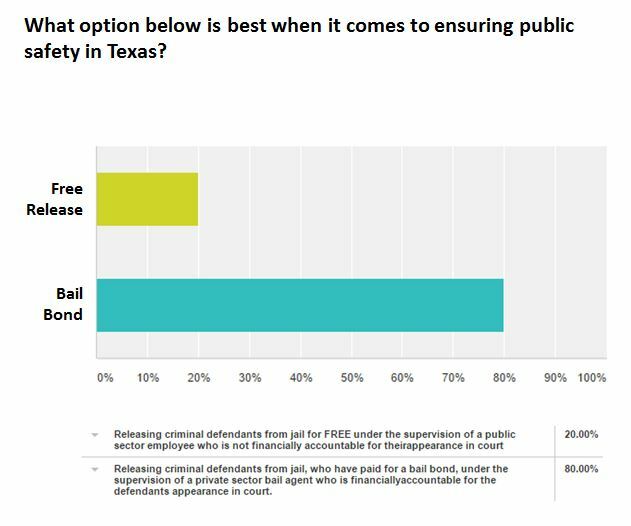 When asked which method of release was better for public safety in Texas, free release or financially guaranteed release through a bail bond, 81% chose financially guaranteed release through a bail bond versus on 19% who chose free release. 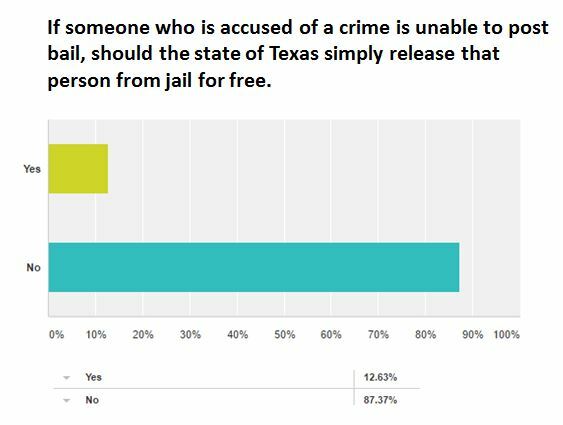 When asked which method of release was better from crime victims in Texas, free release or financially guaranteed release through a bail bond, 69% chose financially guaranteed release through a bail bond versus on 21% who chose free release.